Surely they are here to build a new road. Their bags are full of medicine. They are doctors. They are wanting to be in the Guinness Book of World Records. Villagers speculating as to why we are cycling through their country. Rough roads, violent storms and some pretty rudimentary conditions have been par for the course during this past month of cycling. 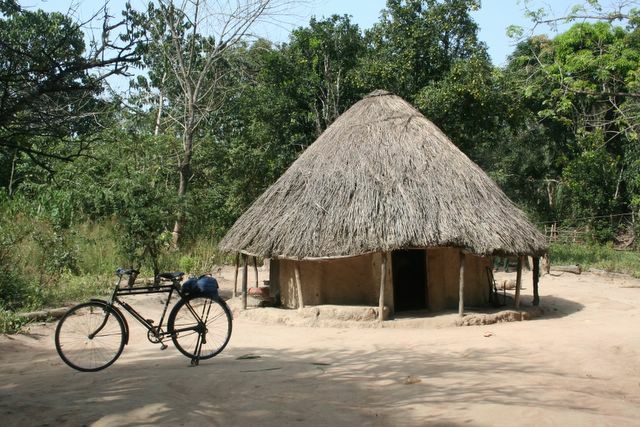 Thankfully, friendly villagers, picturesque scenery and some improvements in the cuisine (although African food certainly won't top our list of favorites!) have compensated for the hard times. 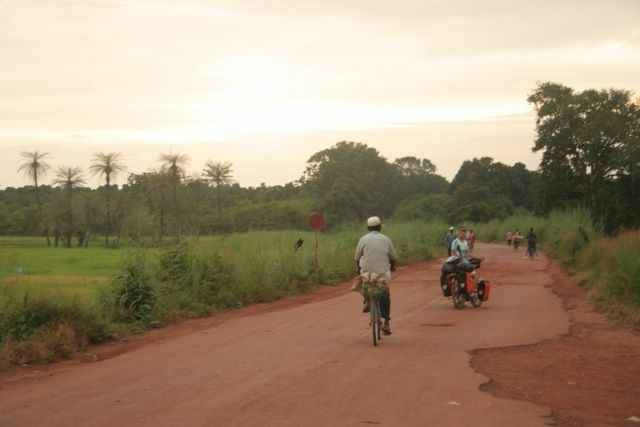 Leaving the beautiful Cassamance region in mid-October, we crossed the border into the former Portuguese colony of Guinea-Bissau. It was in this tiny country that we first discovered that running water and electricity are not things to be taken for granted--even in major cities. In fact, throughout the country there were indeed power lines in place, but no power. Hotels were fitted with taps and showers, but no water flowed from the pipes. Most hotels were equipped with a generator, so we could benefit from a few hours of electricity each evening, and of course water was available, it just had to be hauled from a distant well. There were no great hardships for us as tourists, but we imagine the locals must remember better days when public services were functioning and with just a flick of a switch there was light, and a turn of the tap, water. Guinea Bissau sees few tourists and we were typically asked which NGO we were representing rather than from which country we came. Children sometimes broke out in tears at the sight of the two pale-faced strangers, and in contrast to the incessant begging in Senegal, the only requests were for medicine and newspapers. We're not quite sure if the newspapers were wanted for reading or for wrapping, since food bought on the street always comes packaged in old newspapers from around the world. Starved for reading material, we find ourselves trying to decipher the top stories of June 21, 2005 in Norwegian or devouring the want ads in the New York Times. 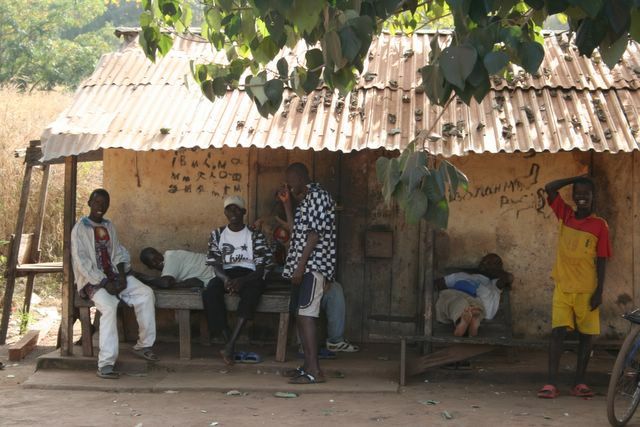 Things are calm in Guinea Bissau these days, and the country is slowly recovering from the bloody civil war that ended in 1999. Our only bit of adventure came when the ferry's engines failed, and we got stuck being transported in an over-sized, motorized pirogue which was crammed full with more than 100 passengers. The bikes were wedged in precariously between a satellite dish and some clucking chickens and we tried to hold them in place as we teetered on the edge of the boat which was sitting frightfully low in the water. The greedy men in charge kept trying to pack in just one more sack of rice or one more goat, but eventually the passengers revolted and said enough is enough, and we set off for the other side. Reaching firm ground again was a real relief! We were welcomed to Guinea with another half-hearted attempt at a bribe. The portly police chief at the customs post ordered us into his office, shoved a grimy piece of notebook paper at Eric and started barking orders. After Eric had noted our essential information, the officer demanded a 5,000 franc 'processing fee'. Amaya immediately dug out an old receipt (we later realized this was from Guinea-Bissau's consulate) and diplomatically argued that we had already paid our fees. Appearing a little crestfallen, he nonetheless conceded that there was 'no problem' and let us on our way. The 'road' beyond the border closely resembled a badly-maintained mountain bike path and we never ceased to be amazed when the occasional vehicle succeeded in making it past. It was rough going, but we were fortunate enough to meet up with some locals who knew the best way around the sandy areas and washed out sections of the road and following them we were able to pick up speed. 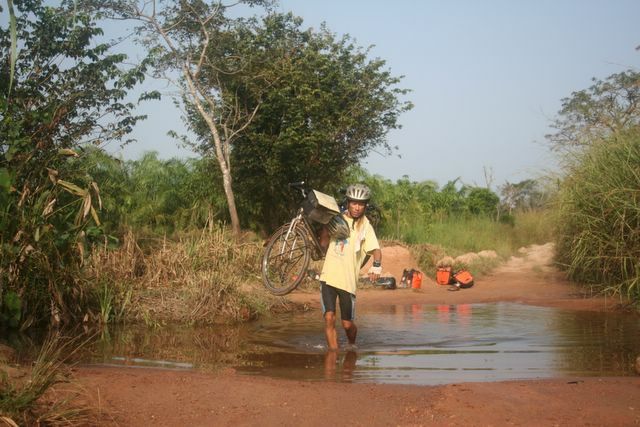 Nevertheless, it was still nearing dusk when after just 95 kilometers we arrived in the northern town of Koundara. We looked in vain for the 'center' and finally realized that Koundara wasn't much more than a collection of mud huts and a bush taxi stand. The next few days were spent making our way through the extraordinary diversity of the Fouta Djalon highlands. We passed through grassy plateaus and lushly cultivated valleys, peered over sheer cliffs, wondered at the fast-flowing waterfalls and conquered some mighty steep hills as we cursed the state of the road. The whole area had a wild, frontier feel to it and each day had its little adventure. Once we were caught in a violent thunderstorm and sat huddled with a local Fula family in their small mud hut waiting for the deluge to come to an end. As soon as the rain had let up a bit we set out for the last few kilometers into town only to find there was no accommodation available (camping hardly sounded enticing given the rain) and, after explaining our 'mission' were invited by the District Officer to spend the night at the local school. In the absence of bathing facilities, we lathered up and enjoyed a refreshing natural shower from the rain pouring down from the roof. Another day, we were transported across a narrow river in a manually-operated ferry, requiring two muscle-bound men to turn the cranks. And we celebrated Id al-fitr, marking the end of Ramadan and a marked improvement in eating options, good news for hungry cyclists. Everyone was decked out in new clothes for the occasion, many children choosing to leave on the price tags as proof of the brand-new status of their outfits. Villagers came streaming down from the hillsides to gather together in the mosques and later the streets were alive with women selling all sorts of tasty snacks to the sound of drums beating and music blaring. Labé is the economic capital of the Fouta Djalon and a nice spot to rest and enjoy some creature comforts and internet access. 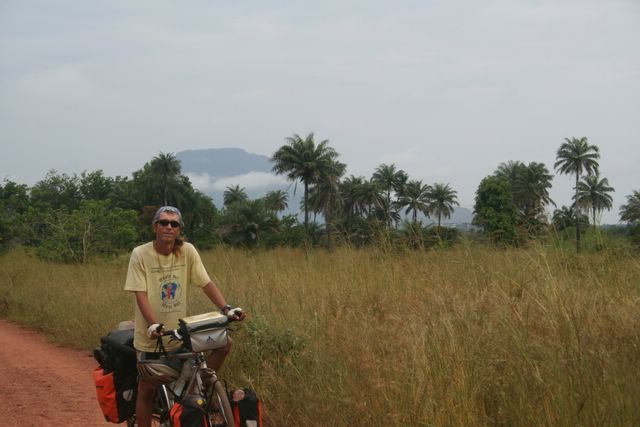 The town was crawling with Peace Corps workers and NGOs, but few tourists (we say just one, another cyclist no less). Eric had been feeling weak for several days, and it was here that the local doctor diagnosed him with a mild case of malaria. A short 48-hour wonder drug treatment followed, and within a week he was back in the saddle again and we headed towards Guinea's chaotic capital, Conakry. It was a dusty and dirty 54 kilometer ride through sprawling industrial areas and shantytowns to reach the city center. The Catholic Mission offered the best budget accommodation, we were told, but they were picky about who they took in as guests. We were careful to wipe the layer of grime off before we presented ourselves at the reception, but to no avail--we we were turned down anyway. Perhaps one has to turn up toting a bible and sporting a large cross to gain admittance. We ended up staying at the Motel du Port, where Eric was asked if he would like the hourly or nightly rate and accommodation included free condoms. 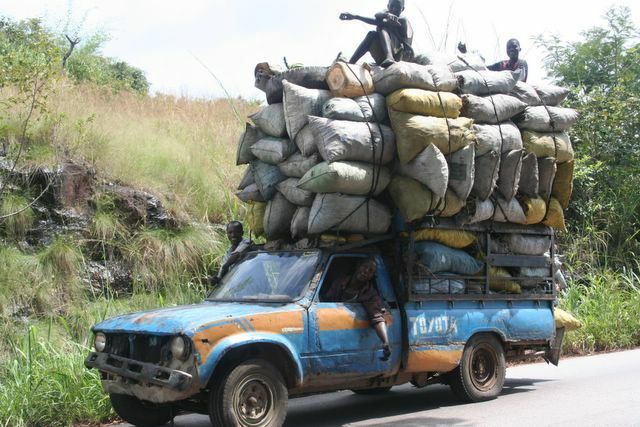 We were in Conakry for a visa run, and had to fork over $100 (payable in US dollars only, no local currency accepted!) for one to Sierra Leone. Mali's visa, at 16,200 francs ($2), seemed like the bargain of a lifetime in comparison. The visas in hand, we set off for the hellish 54 kilometer ride back up the peninsula and then turned south for Sierra Leone. Although we had long debated whether to visit this struggling country, still coming to grips with a violent civil war in its recent past, we have had no regrets. Sierra Leone is steeped in atmosphere and has more to offer of architectural interest than any other West African country we've visited. Residents of the capital are surprisingly sophisticated and with the numerous Lebanese and Indian traders, as well as European and American aid workers, there's something of a cosmopolitan feel to Freetown. Sierra Leoneans being deeply religious people, the churches in the capital were overflowing on Sunday morning, women sporting fancy hats and the men in their best suits, shoes polished to a shine. There was such joy in the air, hands clapping, dancing in the aisles and lots of alleluias to be heard. The city, of course, is not with out its difficulties. Mutilated war victims are a common site, impoverished slums occupy the steep ravines between the city's many hills, and one has to keep an eye on the sidewalk so as to avoid falling into one of the sludge-filled sewers. Although our guidebook mentions that 25% of Freetown receives electricity at any given time, the residents we talked to found this laughable. Perhaps once or twice a month at most, they said, was power available. 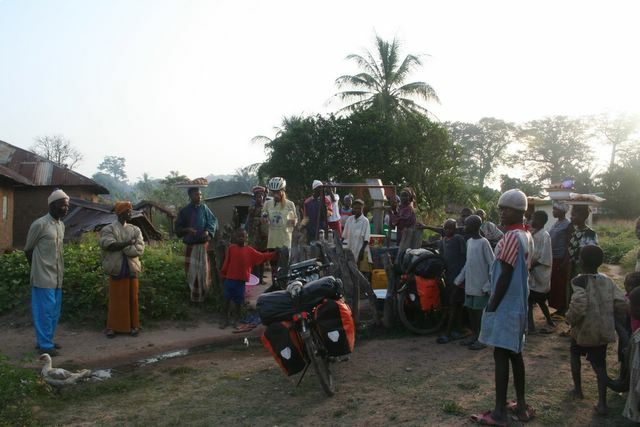 Riding through rural Sierra Leone we attracted crowds of curious onlookers whenever we made a stop. There was pushing and shoving as the men gathered around to take a look at the map and always many disbelievers in the group. 'You come from France on this bike? No, it is not possible!' We've had hundreds of children staring at as we fill our water bottles from the local pumps, and at times, adults have resorted to shooing them away with a stick, so that we can continue our journey. All this attention and instant fame can be tiresome at times, and often we would just like to cycle by anonymously. It was disturbing when one realized that many young men we spoke with were directly involved in the death and destruction caused by the civil war. We found it painful to see the shells of homes burnt down during the fighting and to listen as the locals recount tales of fleeing for their lives. But there's a glimmer of hope when one sees the astounding number of community based projects working towards reconciliation and reinsertion of former combatants. We were able to hear some success stories first-hand when Father Mario kindly offered us accommodation (our own bungalow!) at the vocational training institute he runs in Lunsar. The Italian priest stayed on throughout the civil war and after the peace accords, set up a program at his school to train former child soldiers. He has had remarkable results, with over 87% of the trainees 'changed men' as he says. There are aid agencies galore throughout Sierra Leone, and at the entrance of even the tiniest of villages there are always several signboards announcing the various projects underway: women for sustainable farming, reintegration and rehabilitation for war-mutilated victims, computer training, housing developments, school canteens..the list goes on and on. 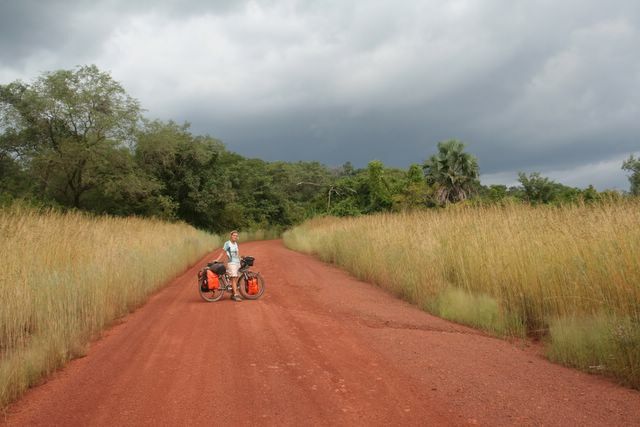 Some of our toughest days cycling came as we slowly made our way through the verdant highlands back to Guinea. 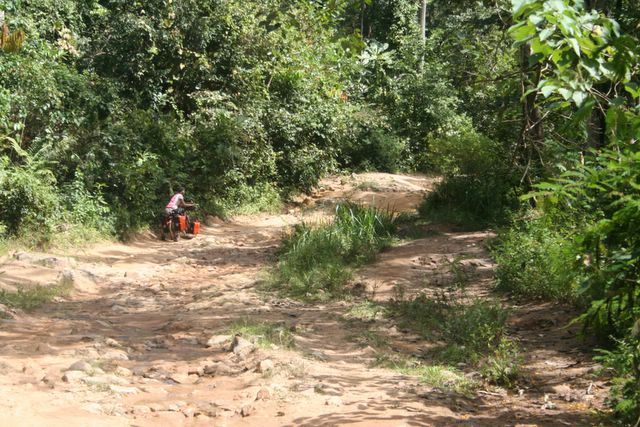 Rock-filled roads rutted beyond recognition, in some places completely flooded forcing us to carry the bikes across the swampy areas. One day our average speed was down to just 9KM per hour. Not a car or truck in site, just the occasional motorcycle weaving its way around the potholes and past some far-flung villages. When we finally made it to the border and presented ourselves at the immigration office the men in charge didn't seem to have a clue as what to do with us. There was no stamp for the passports, so a brief note explaining our situation was scrawled on an old piece of notebook paper and we were told to present ourselves at the police station in the next town. So much for tight border controls. We're back in Guinea now (still without an entry stamp in the passport), so the cries of 'white man' have been replaced with the familiar foté and we've had to give up speaking Krio (Aw di bohdi?/ No bad, bohdi fine! = How are you? / Not bad, I'm fine!). 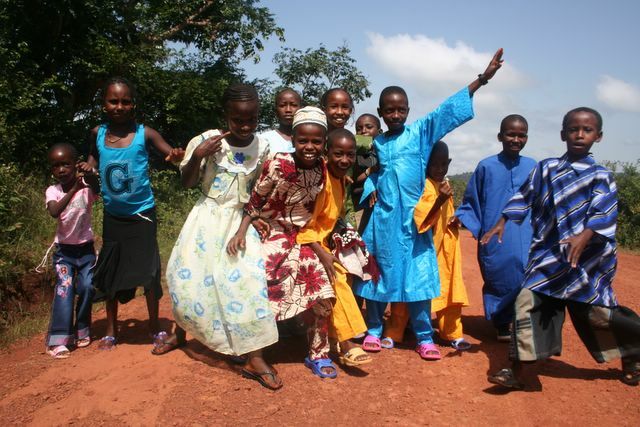 The Guineans are among the kindest, gentlest people we have ever encountered and a world apart from the surly Senegalese. For foreign tourists, life here is incredibly cheap. A comfortable room with air-conditioning can be had for the equivalent of 5 euros. One euro buys you a huge pineapple, 40 juicy oranges and a large plate of potato salad. The climate (well, outside of muggy Conakry) is comfortably cool in the morning and even a bit chilly at night. We're in no hurry to leave, so we'll relax for a few more days before heading on to Mali, where the tourist season will be at its peak. After being so often stared at like exotic zoo animals, we're looking forward to hanging out with some other travelers for awhile and blending in with the crowd for a change.